I don't know about you, but I absolutely loved the long weekend (and I really wouldn't mind having just one more day to relax!). John and I spent our Memorial Day weekend adventuring with friends and family in New Mexico and Arizona. We really wanted to use the long weekend for a mini vacation, but since we are leaving for Europe in less than a month (what?! ), we figured it would probably be best to save money and stay local-ish. 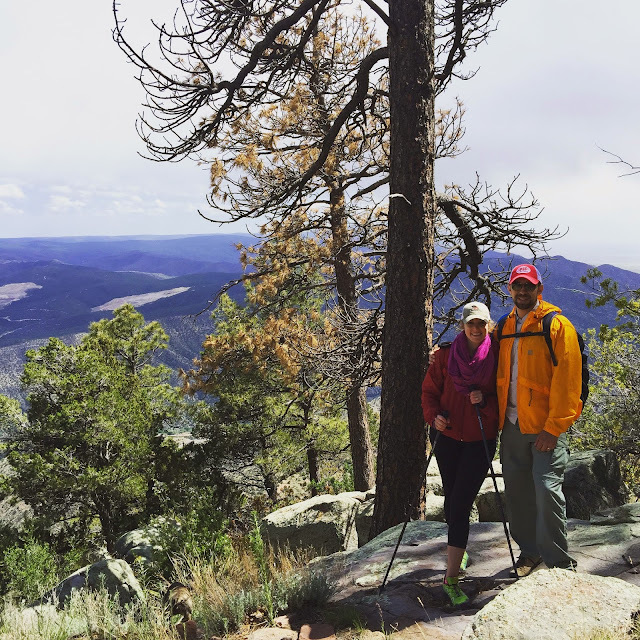 Here's a quick recap of our weekend exploring the Southwest! We left for New Mexico after work on Friday, and we didn't end up getting in until about 2AM. We went straight to bed, and woke up very excited for an amazing breakfast at The Range - they have massively large portions of New Mexico goodness... exactly what we needed to start the weekend off right! We spent the day hanging out at John's mom's house. 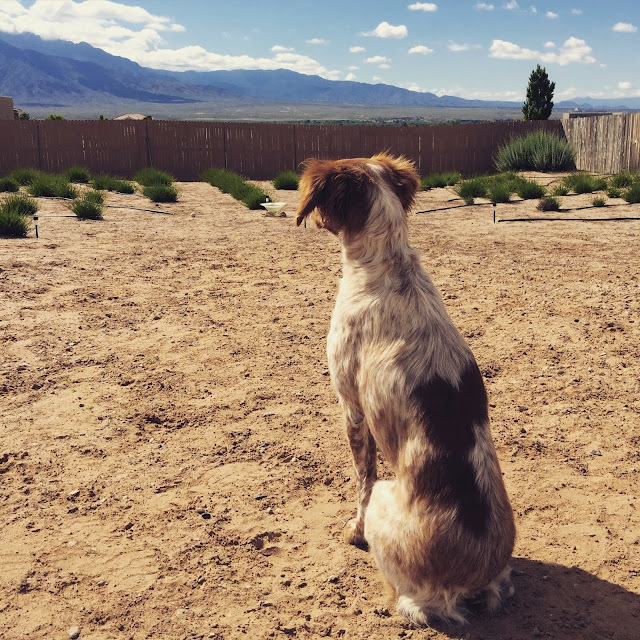 She has a great backyard with a beautiful view... and Scout very much enjoyed being able to run free and chase birds! As much fun as John and I had this weekend, I'm pretty sure that Scout had even more. 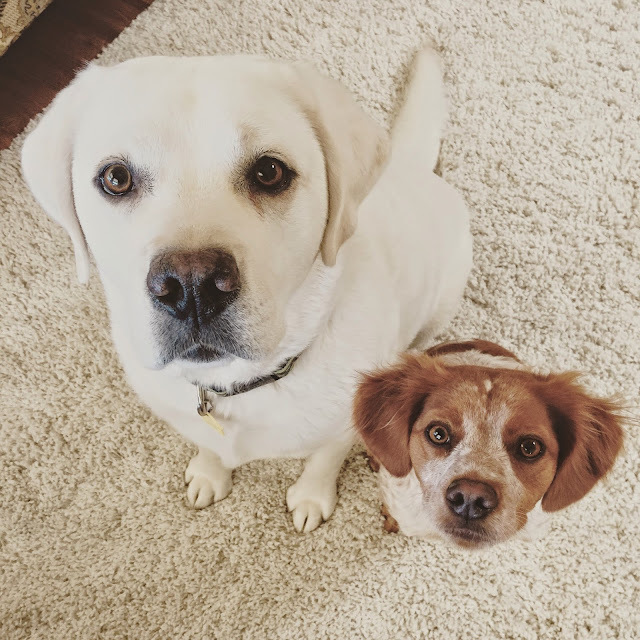 John's mom has the sweetest dog, and Max and Scout get along so well and basically played together the entire time. I mean really, could they be any cuter?! Later in the day we met up with our good friends Jared and Faerl for a quick hike and some delicious food and drinks. Funny story: Faerl and I met at a dog park... her dog Marble and Scout really hit it off! Fast forward a year, or so, and Jared and Faerl have become some of our best friends. John and I had just moved to New Mexico, and knew absolutely no one, and Faerl and Jared were such a blessing to us! 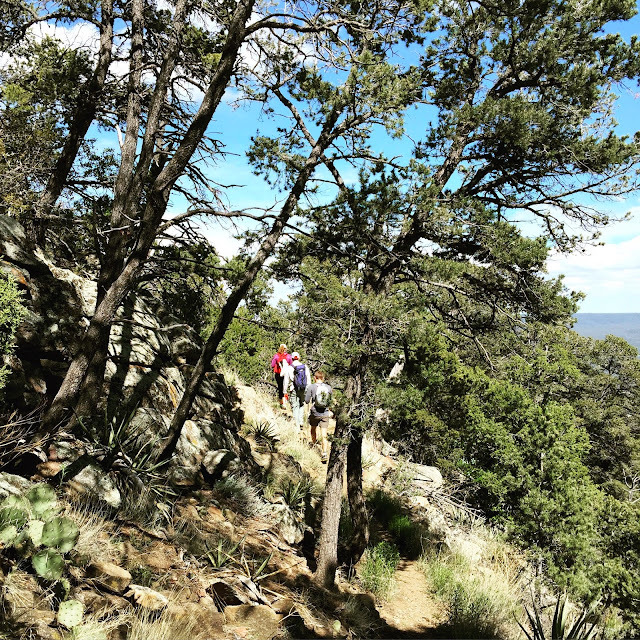 Sunday morning, the four of us met up to hike the Sandia Crest trail. We dropped off a car at the top of the mountain, and the plan was to hike up and drive down. 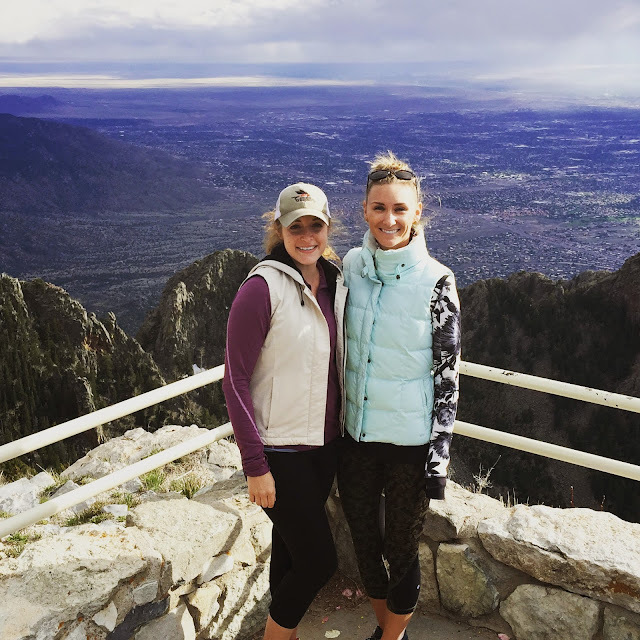 When we got to the top (about 10,600 feet elevation), it was so cold, and we were certainly not dressed properly! Thankfully we grabbed a few more layers so we wouldn't die (literally for me, figuratively for them). 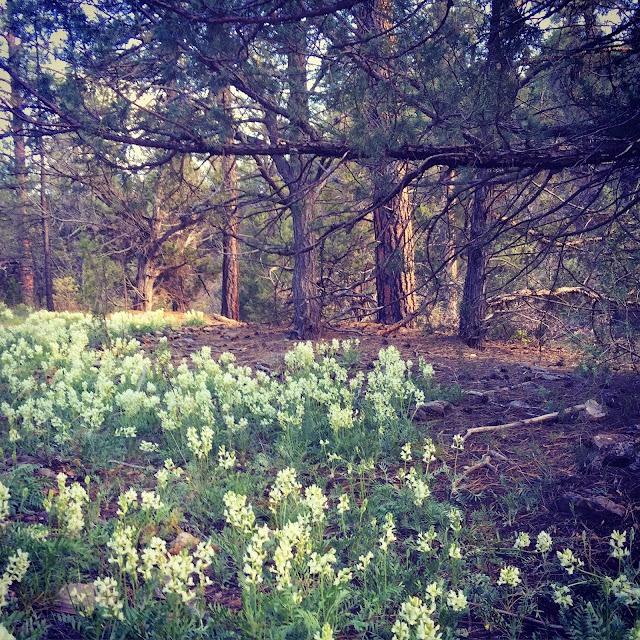 As much as I enjoy all that Arizona has to offer, I really love a good forested hike! The views were beautiful, and the weather (for the most part...) was perfect. We stopped for lunch, and it started to rain/sleet... not my kind of thing! I used to live in Michigan, and I really shouldn't be such a wimp, but when it comes to cold weather, I just can't hang. We decided to turn around and head down in case of lightning, etc. Not surprisingly, shortly after turning around, the sleet let up. Shocking, I know. Why is it that whenever you decide to turn around, the weather will cooperate, but whenever you decide to keep going the weather gets worse and worse?! 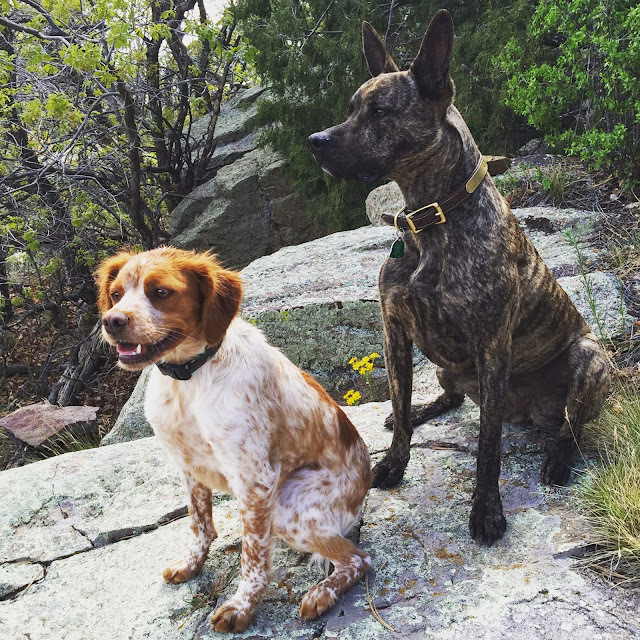 Scout and Marble were quite the hikers. They went between exploring, chasing, and wrestling with each other... You best believe we had some tired pups on our hands when all was said and done. By the time we finished hiking we went about 9 miles, but since we had to turn around, we had to drive back to the top of the mountain to get our car. 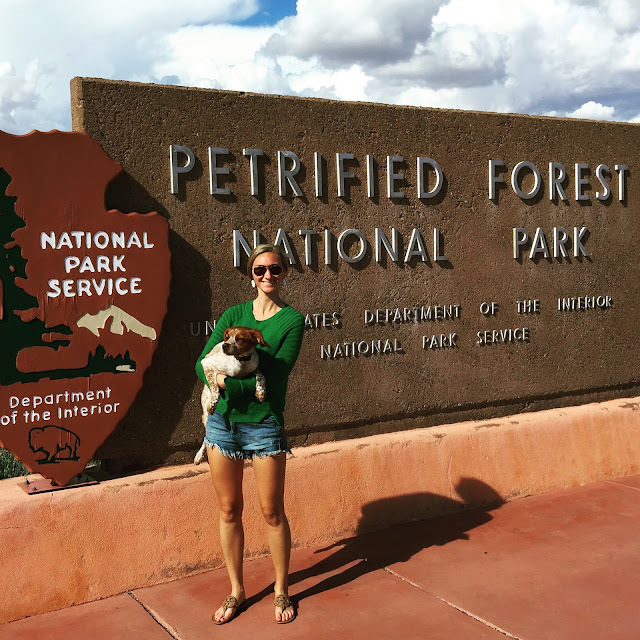 On Monday we headed back to Arizona with a pit stop at Petrified Forest National Park. 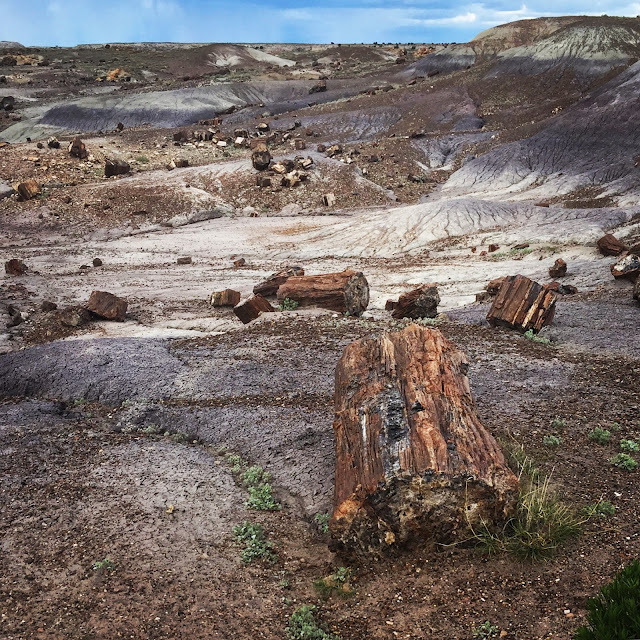 Petrified Forest is the only National Park in Arizona that we hadn't been to, and we were looking forward to checking it off our list. The park was very cool, but if I'm honest, I just don't think I quite "got" it. Basically, there's a bunch of super old trees (over 200 million years old) that fossilized and turned into stone. It was cool, but it was kind of just a bunch of rocks/fossils laying around that looked like trees. 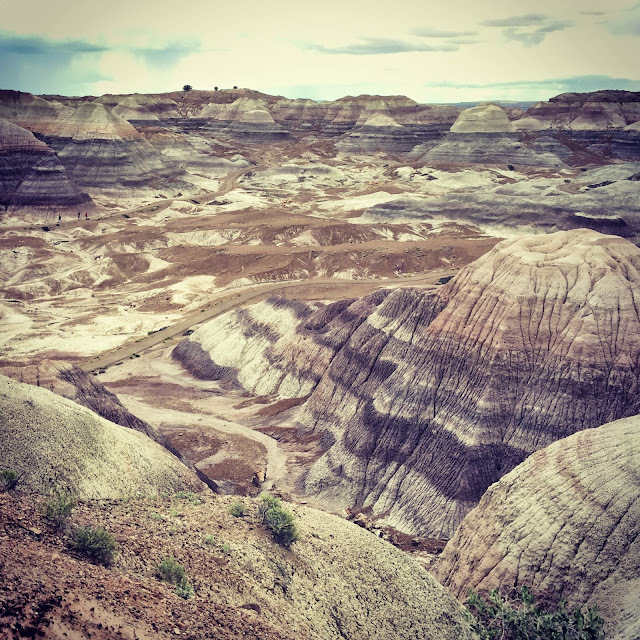 It was pretty crazy how old everything was and the badlands made everything look like we were on the moon! 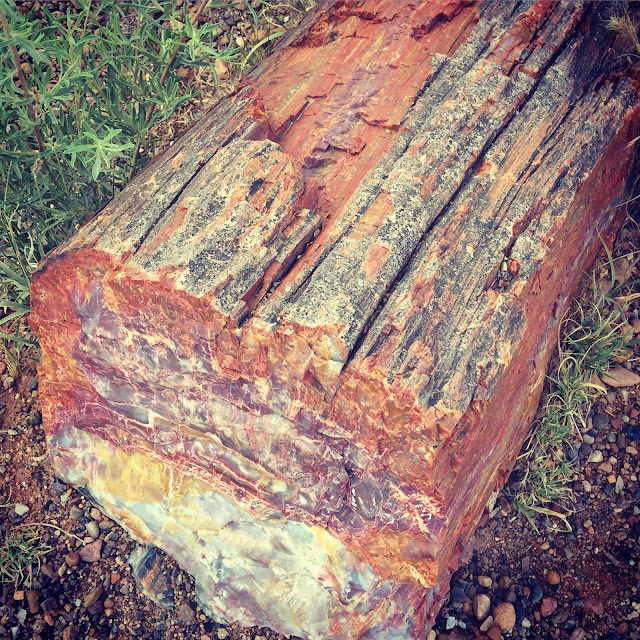 Don't get me wrong, the fossilized trees were absolutely beautiful (and the colors were amazing! ), but it's just that there wasn't much to do, it was more of a snap a photo and leave kind of thing. 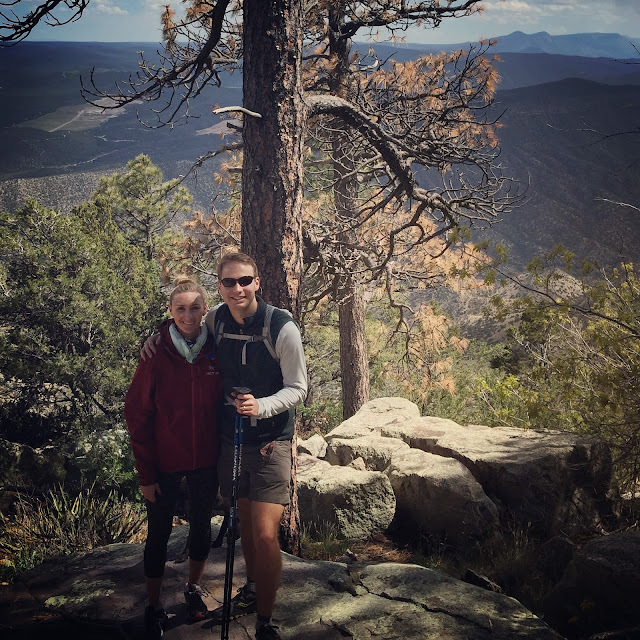 All in all, John and I had a great weekend exploring New Mexico and Arizona... there is so much beauty in the Southwest, and we are enjoying getting to experience it all! What an amazing weekend! 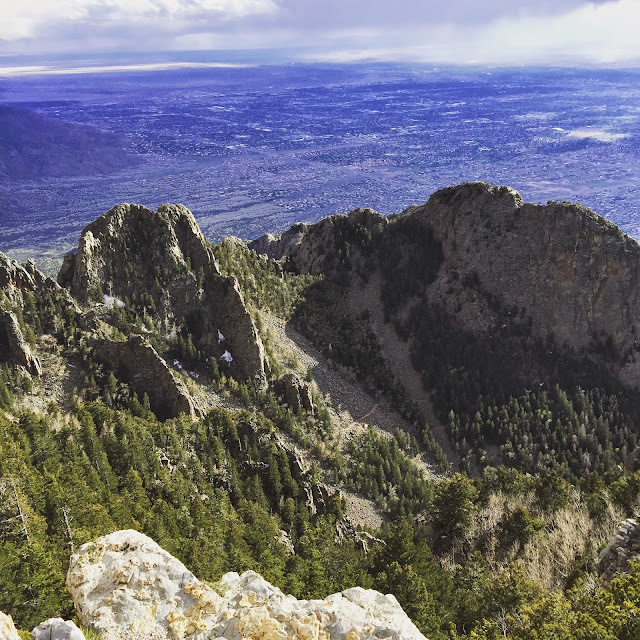 My parents live in NM near Sandia and it is absolutely gorgeous! Although they did tell me it was still pretty chilly at the top! Lisa! You are so funny! This post made me laugh, one-and-done kind of thing! 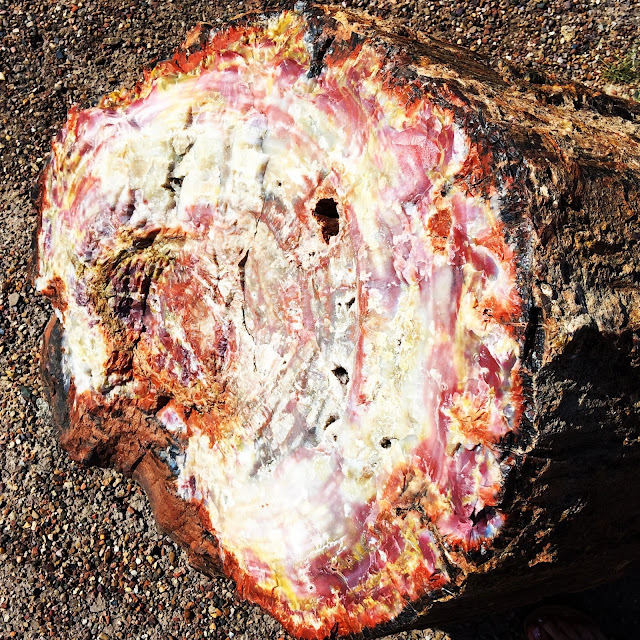 You did see the Painted Desert, and the cool tree/rock/petrified things. :) That national park is cool because it is so different I think than anything else out there, just very unique. Michael and I did a trip there about Seven years ago, and then ventured up to the Grand Canyon! 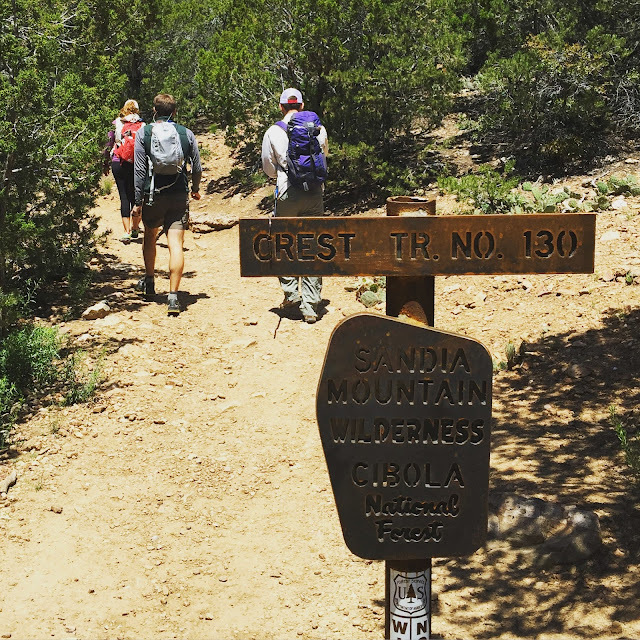 I'm so happy you did the Crest Trail, I think it is a full 26 miles in length, definitely the longest of the Sandias! I've never done the whole thing, but the section you guys did looks awesome! My littlest brother and I hiked to the first Tram Tower last weekend when I was there, and we layed on the rocks in the sun under the tower and ate Subway cookies and watched the Tram pass over us! He's 10, and he loved it! 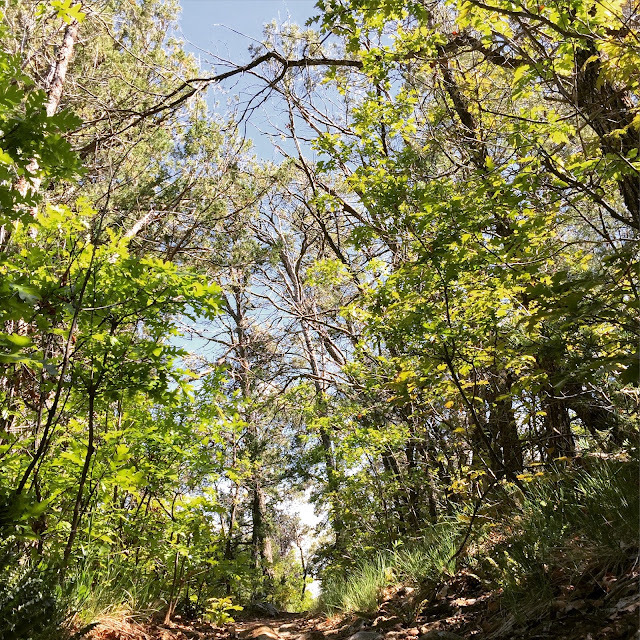 Hiking in the Sandias is so magical, I'm so glad you guys had some fun, even if it was a bit chilly! :) LOVE looking through your pictures girly! :) Happy Tuesday! Scout looks SO BIG HERE!! Did she grow or is that just the excitement?! Can't believe you guys hit sleet - lol - but man, what views!!!! Those views are so stunning!! I can't stop staring at them. What a fun and adventurous weekend you guys had! I'm always so envious of how much you seem to pack into each weekend! Scout will all her puppy friends is adorable! 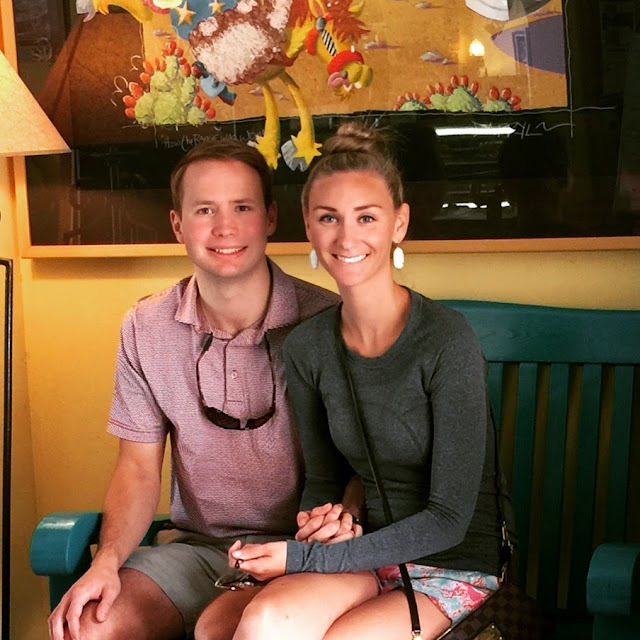 You make me want to plan a Southwest trip! All of your pictures are gorgeous!! a post filled with puppies. love it! all of your hiking pics are awesome too! How fun! I love all your adventures! It looks like you had an absolute blast. Goodness you guys know how to ENJOY a weekend!!!! We want to come next time ;) so much fun! Seriously Scout is so cute!! I might steal him! So gorgeous for sure! Those puppy faces get me every time ;) Cheers to a perfect weekend away! lol I like your description of the old trees laying around. I would probably be with you. Quick stop, take a look, snap some pictures, and leave. One and done style. Love the pups though! So fun to bring the dog along and have some playmates. playpups? Mine are such loners. We bring them to Aria's godfather's house and he has a year old pup that just would love to run and play...mine want nothing to do with him. I love John's mom's backyard. Max and Scout are so adorable in that picture. I'm not sure if I would "get" that park, either, to be honest. Beautiful pictures. Scout is so stinking cute. I'd agree about the fun level! Sorry the Petrified Forest was a let-down. I guess it just proves how much of I nerd I am to have recommended it so highly. Thanks for a super-weekend, we had a blast with y'all and M misses S already. The adventures you go on are just breath taking! I want to go! So many cute pups! And views! I love reading about the places y'all go!